When New Girl ended its sixth season, showrunner and creator Liz Meriwether didn’t know if the series would be picked up for a seventh, so she (and her always-capable writers room) packed the possible series finale with enough joyous farce and ferocious love to serve as a finale. Appropriately enough, as the series actually comes to a close eight episodes (and, in-universe, three years) later, that sense of farce returns, amplified and exalted and even more joyous. 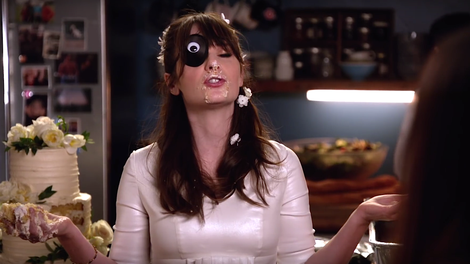 If you leave “The Curse Of The Pirate Bride” with only one lesson (and if that lesson cannot be “Put a googly eye on your bridal eyepatch,” because seriously, put a googly eye on your bridal eyepatch), let it be this: Do not attend to other business at a wedding. No contractual power moves, no last-minute declarations of love, no fretting over leases. This is doubly true if it’s your wedding. Get there, get married, get out. Do not get distracted by bird poop or smitten exes or worried mothers. "The Curse Of The Pirate Bride"/"Engram Pattersky"
Bodily emergencies are excused, so Aly gets a pass for going into labor, and Nasim Pedrad gets a hand for sublimating Aly’s labor pains into a variety of transparent excuses groaned out through gritted teeth, her eyes wild. And Jess, who at her mother’s suggestion gets “so high” (I can’t be the only one who sang out “Return of high Jess!”) to quell the pain of her hamburger eye and the anxiety of invoking a curse, is forgiven for digging into her own wedding cake early and wandering off to a stairwell with her former fancyman and current boss. As “Curse Of The Pirate Bride” opened on a charming reception set up on the roof of the loft, I thought, “Of course! The loft is where it all started, the loft will be where it all ends.” But I didn’t give the writers enough credit. Jess and Nick’s love story is bigger than the loft; it always was. All of New Girl is, and was. After a series of minor-to-major wedding-day disasters, Jess and Nick end up getting married not at the loft, where all their planning placed them, where all (or most) of their friends await them, but in the corridor of a hospital under a bower of get-well balloons, while Aly and Winston await the birth of their first child. It’s a goofy idea that the entire wedding party would exeunt right before the ceremony to accompany one couple on their way to the maternity ward, and it’s carried off with effortless New Girl logic when Russell, offering to drive Aly and Winston, corrects himself mid-sentence: “Wait! Everybody come, I forgot who we’re dealing with.” This bunch of goofballs sticks together, and that is the real love story at the heart of New Girl. It was never just about the titular new girl, never just about the will-they/won’t they. It was always about this group of unabashed, passionate misfits finding a place where they fit. As heartwarming, sweetly silly, and attentive to New Girl’s history as these last two episodes are, they include some oversights, missteps, and contradictions. Joan Day (Jamie Lee Curtis), notably absent from a shortened season that heavily featured Jess’ dad, shows up for the wedding, but Nick’s mother (played by beloved character actress Margo Martindale) and the rest of his family are nowhere to be seen. Nor is Jess’ trouble-making sister. In “The Curse Of The Pirate Bride,” Joan brings the stack of eviction notices to Jess’ attention for the very first time just before her wedding. In “Engram Pattersky,” Jess knows not only when the notices arrived, but that Winston was inside with her each time one slid under the door. Both of these can’t be true, and neither of them is necessary to the story. But, in an inversion of Winston and Schmidt’s rehearsal-dinner philosophy, I say “Why roast when you can toast?” If the prank was a little too little and a little too big, if Jess’ sentimental tyranny is a little too manufactured and a little too unhinged, if there is some contradiction in who knew what when and who shows up for a wedding, well, it’s no more preposterous and no more confusing than one more game of True American, and a misty glance into the future that promises many more games to be imagined. New Girl transformed itself from its at-first-glance concept—“a weekly space for Zooey Deschanel to do the chicken dance and sing nonsense songs”—to a rounded, grounded, emotionally honest ensemble comedy, crammed full of love and heart and welcome silliness. Early in the series, it was revealed that the loft—which came to represent New Girl even after core characters started moving out—was housing more people than the lease allowed. New Girl did, too, carving out room for more people, more personalities, bigger personalities, and for complex, often unexpected relationships, always supported by the nimble comic chops of its gifted ensemble. Though the series ends with the wedding of its OTP, New Girl has more than one love story at its heart, and more than one kind of love. There’s the love story between Schmidt and Nick, who finally says those three little words to his longtime roommate in the series finale. There’s the love story between Nick and Winston, so strong a bond that Nick couldn’t countenance another Winston in his life. There’s the love story between Winston and Cece, whose very first classic mess-around is revealed tonight as the characters, the show, and the audience all say goodbye to the loft. The loft where Jessica Day and Cece Parekh first met Nick Miller, Winston Bishop, Ernie “Coach” Tagliaboo, and Winston Schmidt is special. But, as Cece sums it up, “We’re not in denial, we’ve just done everything we need to do in this loft. We’re ready to say goodbye.” The loft is where it all started for Jess, and for the audience. But the loft doesn’t have to be where it ends, even as it ends. Nadia’s toast—“May you die together”—isn’t as bleak as it first sounds. There are worse things than living a long, weird, wonderful life together and then leaving it together. 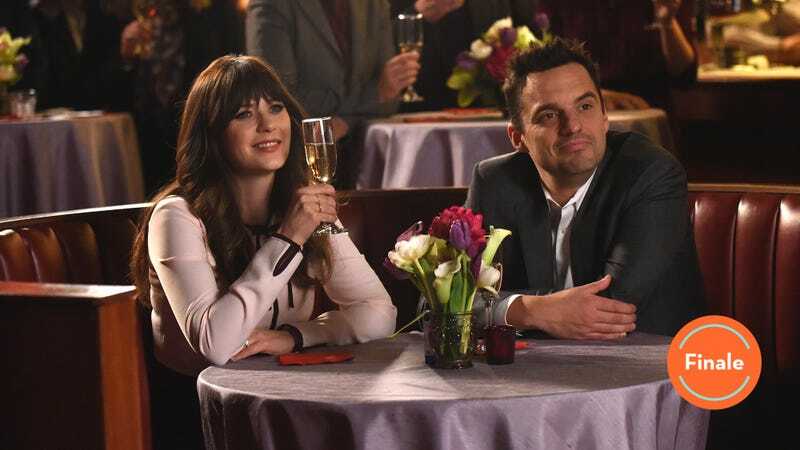 But with its glimpse into a possible future, New Girl has given Jessica Day, Nick Miller, and their family of friends an even better fate to imagine: a long, weird, wonderful life together, and a new generation to pass it on to, no matter where that future takes them. That’s New Girl writer/story editor Lamar Woods (who wrote last week’s “Godparents”) as Blaze, the chauffeur destined to lose his limo. And that’s Robert Smigel as the hospital officiant, the only one not to wince at Jess’ eye. “I wasn’t touching it!” “I love you. Also, your wang is out.” I understand they wrote their own vows. That’s it for New Girl. I’ll miss this collection of goofballs, and I’ll miss writing about them for you every week. As always, thank you for reading! Hey, girl, whatcha doin'? Hey, girl, where ya goin'?